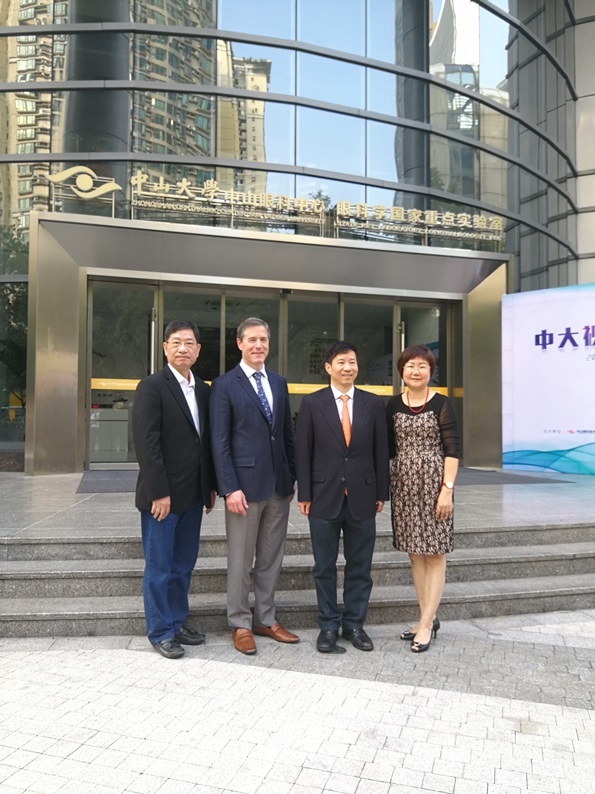 On Sunday 3rd June 2018, ZOC was pleased to welcome two outstanding foreign Ophthalmologists to the new hospital buildings in Zhujiang New Town. Dr Neil BRESSLER who is Chief of the Retinal Division of Wilmer Eye Institute at John Hopkins University, USA, together with Dr Lee-Jen CHEN, Senior Physician at Mackay Memorial Hospital in Taipei, Taiwan. They were welcomed by Professor Yizhe LIU Director and Professor Xiaoling LIANG Vice Director of the ZOC. It was Dr. BRESSLER’s first visit to Guangzhou. He is Director of numerous continuing Medical Education Courses at Johns Hopkins University as well as being a National and International Referral for Retinal Diseases. He is currently the Editor in Chief of the Journal of the American Medical Association (JAMA) Ophthalmology. It was Dr. CHEN’s second visit to Guangzhou, his first being about 10 years ago. He is presently the Chief of the Department of Ophthalmology at Mackay Memorial Hospital, Taiwan and is renowned for his teaching. He has been the author of 14 peer-reviewed articles and has been involved in five long-term Clinical Trials. They enjoyed a video presentation about the new ZOC Zhujiang Hospital. They were both equally impressed with the new buildings and the first class facilities on offer. The representatives who joined the meeting discussed the potential opportunities and challenges in clinical trials.